Everyone who reads this is welcome to attend Melapalooza '08. Please be aware that we open doors at 2:00. I think there's some confusion over what time the party starts, so I just want to make sure I make a final note about that one. As much as we love all of you, I'm kicking you folks out before midnight. The League needs his beauty rest. Anyway, hope to see everyone. If you need directions, etc... do not hesitate to e-mail. Just a quick FYI. Jason's band, the Mono Ensemble, will be playing at Club DeVille tonight at 8:30ish. Jamie, Doug, Nicole and I will be there to have a drinky drink and salute the Mono E.
Don't you feel the need to rock? DON'T YOU???? Around 1995, after the Holiday festivities at my folks' house had wrapped for the day and the relatives were headed off to bed, Jason and I headed to a longtime Kuykendahl-based watering hole, Molly Maguire's. The place is dark, smelly, has a few pool tables, etc... and the sort of local color one would expect so close to the edge of 1960 and Kuykendahl. Plus a barkeep who I believe may have actually been Irish (I didn't press the point). It being Spring by Houston, at the end of the 1990's, the scene in Houston was very cheap-beer-rock-centric. Houston loved its ACDC and ZZ Top, to the point where every time I would re-enter Houston from 1993-1997, I was literally able to find ACDC playing somewhere, on some station. And this bar's jukebox was littered with 70's and early 80's rock classics, a fact I was entirely unable to appreciate at the time (but, seriously, they should have enshrined that @#$%ing jukebox as a time capsule representing a time and place). You can read Dave's(of Dave's Longbox) review of the ad here. I didn't think this looked a darn bit like Meat Loaf. And I didn't remember Meat Loaf playing much guitar or giving two flips for Special Olympians. 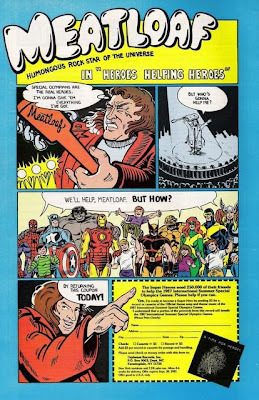 And I wasn't going to cut up my X-Men or Cap comics on Meat Loaf's say-so. Especially with the creepy finger of Mr. Loaf still attached to the coupon. In high school I finally rented "Rocky Horror Picture Show", and was surprised to find that Meat Loaf was featured as Eddie (what a guy!). And I dug the song he played. Plus, you know, Little Nell as Columbia rocked my socks (perhaps a future DITMTLOD?). As I entered college, Meat Loaf released "Bat Out of Hell II: Back Into Hell". An album I decided I would have to be too hip for, and for that I apologize. Especially to Peabo, who defended the single "I'd Do Anything for Love (but I Won't Do That)". The video was the sort of high-budget, mini-movie that Aerosmith had developed with "Janie's Got a Gun", and Guns'n'Roses had perfected with "Use Your Illusion". And because I was trying to be awesome and punk rock, I wasn't about to be into a middle-aged dude's rock opera nonsense (even if I kinda liked Queen). The video also featured the lovely Dana Patrick (lip-synching to Lorraine Crosby), who I never heard of or saw in anything else. Which is a shame. It was during that dark night, on what was turning into a lengthy Christmas break that Jason headed back to the table from the jukebox and announced "I just put in money. We're going to listen to all of 'Bat out of Hell'". "You don't like Meat Loaf?" "You got to give Meat Loaf his respect." Steanso was pretty keen on teaching his younger brother to show respect for all sorts of stuff. This was not new. Anyway, we had our cheap beer, and they hadn't carded me, so I wasn't going to put up a fight. I didn't become a Meatloaf nut on that night, and I never really have gone completely crazy for Meat Loaf. But I do, now, as they say, respect the man. I respect the hell out of Meat Loaf, and I have "Bat Out of Hell" on my iPod. And as much as I like big, overblown songwriting that delves deep into the melodramatic without blinking (I own, like, six Roxy Music albums), how could I not be a sucker for "Paradise by the Dashboard Light"? I love that song. I love how absolutely HUGE Meat Loaf knows a rock song can and should be. It doesn't always work, but when it does, man... that's not just a rock power ballad, you've got yourself an anthem. Meat Loaf has a crazy expansive career, including acting. If you didn't love him in Fight Club, well, more's the pity. Most recently "Paradise" was adapted for a commercial for something called a Go-Phone. Johanna did a bit on it over at "Comics Worth Reading". I'd seen a shortened version of the video with Jamie, and saluted Mr. Loaf for being a sport. I still think its hard to forget the context of the original song when watching the commercial, which makes it... odd... to say the least. Apparently the Mom in that commercial? That'd be Tiffany, who is better looking than I remember as she's aging (although I sort of thought the Debbie Gibson/ Tiffany battle was a fight in which we all were losing, at the time), and certainly a much more entertaining performer. So, a salute to Meat Loaf. He's a hell of a performer, and apparently he's got a pretty good sense of humor about himself. I have a little extra freetime (cough... cough...), and so I've set up a Facebook group for all Loyal Leaguers. Want to upload photos of your kid? Want to upload embarrassing photos of Randy dancing on the bar at Coyote Ugly? This is your forum. Got a video of Jamie punching out a meter maid? Click "send". Want to start a discussion board topic of your own? We're your huckleberry. Some of you may have received an invite, courtesy of Facebook. If you did not, I think Facebook's search should be able to find us. If not, let me know and I'll see what I can do to help. If permissions become an issue, let me know. I'll see what I can do to add you to the list of folks who can edit, alter, etc... the LoM Facebook group. Why not go to Facebook now and sign up? In the mid-80's, Teen Titans and X-Men were the go-to books of choice for many readers. Both were team books. Both featured a youngish cast with problems from a soap opera, littered with decent villains. Both had writers which planned long term and built a universe within the book. My first exposure to Teen Titans was actually in a DC anthology, published in a smallish format called a "Blue Ribbon Digest"* (they'd reduced the page size). The reduction probably didn't do George Perez's art any favors, and the issue was not about non-stop action, but rather... the wedding of Donna Troy to some bearded dork named Terry. I would be college before I would consider the matching of a nebbish dweeb to an Amazon princess to be an odd pairing, and to this day I think its the creepiest thing to ever occur in Titans. Titans sold big numbers back in the day, but, as these things occur, somehow the fanbase drifted away. Including myself. I don't know if it was a change up of creative teams, change up of the roster (I recall being confused and annoyed by the "Danny" character), the conclusion of too many threads by Wolfman leaving them grasping at straws... And I've heard weirdness about the decision in the 1980's to make Titans a direct market book, which seems almost suicidal in the age of the spinner-rack and before most readers were old enough to have a driver's license. I think DC and Marvel, in NYC, often lose sight of what it means to not have public transportation readily available to get the kids to a comic shop. Many, many incarnations of the Titans have resurfaced since the 80's run drew to a close. Aside from the Geoff Johns penned run of Teen Titans (circa 2003), none have really taken off. Even that "Teen Titans" series eventually became a plotless slugfest with underdeveloped characters who whined relentlessly. And, it didn't star the Wolfman-era Titans, anyway. The new series picks up the action from the Titans East one-shot which ran several months ago to absolutely no fan reaction. Penned by Judd Winick, he of the "let's bring Jason Todd back to life" plotline, the narrative of the issue is entirely dependent on a huge amount of a priori knowledge by the reader. In fact, for a number 1, there's literally no way a reader would be able to follow this issue without a whole lot of DC comics at their fingertips. It references the series "52", Countdown to Adventure, 70 years of Batman comics, recent storylines/ mindless violence of Teen Titans, the Titans East one-shot, JLA, the Flash comics, etc... And while all of those should be respected by a writer on a team book, assuming the reader is up to speed is a mistake. Further, the conclusion of the issue references a run of Titans which occured more than twenty years ago. Twenty (actually, something like 24 years ago). It's not a big deal to do this in comics. Dusty, bench-riding characters re-appear all the time in comics. But the normal MO is to drop some exposition and treat the reader coming to an issue marked #1 as if this is a brand new comic. I'm not sure this would prevent this reader from believing that Winick has made a career at DC out of taking decent concepts from the past and recycling them and/ or putting a pretty bland spin on them. In any case: what is DC saying by assuming new readers will be up on a 20+ year old story? And begin the action as if this were just another mishap in the lives of the original Titans? The gravest mistake Winick makes is going for the tried-and-true mode of bringing a team together by having all of them randomly attacked by a former villain who has returned from the grave. I feel a bit cheap criticizing this tactic as Morrison ingeniously used it in recent issues of Batman, but perhaps that's the difference between Winick and Morrison's skill level. Add in Churchill's cupcake skirt cheesecake art, and there's nothing to love here. Given Winick's tendency to sort of muck up a lot of good concepts (the ScareBeast? Really? ), and the retreading of the Trigon story, which seems as if its pretty well-worn territory at this point, I'm not in for issue #2. 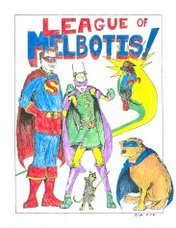 For Leaguers looking for (a) a comic they can put in the hands of their kids, or (b) a genuinely funny, if a bit adorable, read... Tiny Titans is your comic. 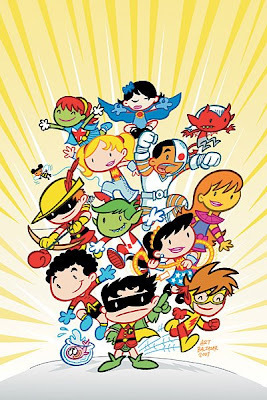 Tiny Titans is intended to reach kids well under the median age of comic readers, and should be aimed at 4-10 year olds. Little kids will like the pictures. Olderkids will like the hi-jinks and school setting of the series. It features Titans from all eras of the Titans, from Rose Wilson to Kid Flash (Wally). The concept is fairly simply: There's a school where the superhero kids go. It's just plain old school, not superhero school. The villains of Titans are cast either as teachers or rival kids within the school (Deathstroke is leading Show and Tell, which is hilarious in and of itself). Titans are mostly a bunch of goofy kids in capes and masks with powers which are best for goofing around, and not necessarily crime-fighting. It's a cute comic. I'd hand it to a kid in a heartbeat. If they don't get the jokes, well... woe unto them. I suspect that if the indie crowd found Tiny Titans, it could be their only non-Vertigo DC title they'd pick up, especially thanks to the little in-jokes and whatnot that pervade the comic. *Why DC does not publish a similar sort of anthology these days is beyond my ability to comprehend. This WAS my gateway drug to the DCU. It fetured Legion, Outsiders, Infinity Inc. and the Titans. Looking at this page, it looks like, had I found more of these, I would have been into DC many years earlier. I just think its a neat format, and the price point seemed like a good entry for folks wantuing to try some stuff out. I'm pretty sure that if you're making a movie about Chimps. In Space. You kind of have to let me know. Anyway, there's a cartoon coming out about Space Chimps. I'm just not sure it looks like my cup of tea. The League's latest adventure in employment didn't wort out as planned. We regret the inconvenience. It's nothing bad. Everything was 100% voluntary. It was, as they say, not a great professional fit. I now understand what that means. Because I am now seeking other employment and do not want to moderate a lengthy discussion on "what happened", which was nothing, I am turning off comments on this post. If you have a job and/ or sack of money you'd like to give me, I can be contacted via phone, text or e-mail. We'll be back to regular programming ASAP. It's been quite a darn long time since The League made a to-do over our birthday. But its safe to say today turned out pretty well, all things considered. I spent some time rockin' with first Jason, and then Jason + Reed. Then Jason + Reed + Jamie. Enjoyed some sunshine. It was a pretty decent sort of day. This evening we met up at Artz Rib House on South Lamar, and many-a-Leaguer showed up for BBQ, the music of Austin's own Flyin' A's, and to have a drinky drink. The list, in no particular order, included. We were also joined by special guests: Natalie P and her mysterious friend from California. Natalie's appearance (con Lydia) was a nice addition as I had never actually had opportunity to meet Natalie face to face. She's a total sweetheart, and it was my pleasure to finally get to spend some time chatting with her. We also had a surprise appearance by Alfredo Garcia and his ladyfriend. Add in a birthday serenade by the Flyin' A's and a few birthday shoutouts from Hilary and Stuart, and, hey... we had fun. We came back to the house for a few drinks and to chat, and everything is sort of wrapped up now, and I'm a bit tired. So, thank you to everyone who came out. And a special thanks to those who gifted me for my b-day (you know who you are, and you all went above and beyond. I sincerely appreciate the gifts). Thanks for the birthday wishes. And thanks for giving me a great birthday, to one and all. Now we have to do it all over again next weekend for Mel..